The internet has been flooded with ‘first world problems’ over recent years, a humorous look at the trials and tribulations of living in a wealthy industrialised world which third-worlders could only scoff at. “I had to go to five fishmongers until I could find a lobster, what is this town coming to?” “my charger cable is too short so I can’t use my phone in bed” “my shampoo and conditioner never run out at the same time” – you get the drift. Well apparently there’s a new first world problem that desperately needs solving – superyacht guests getting BORED when they’re at sea. Yep, 50-million-dollar’s worth of floating luxury is now seen to be desperately lacking in the entertainment department. Sympathetic to this first-world plight, Manna’s mantra is ‘adventure cruising’ and the Ocea Nemo is equipped with a catalogue of water toys to provide a kaleidoscope of experiences. There simply won’t be time for anyone to say they’re bored. A joint effort between Ocea Yachts (specialists in aluminium shipbuilding located on the French Atlantic coast) and Fulvio de Simoni (superstar Milan-based naval design architect who has been designing for global shipyards since the 1970s), the first Ocea Nemo is a 44 metre (144 foot) Sport Utility Yacht. 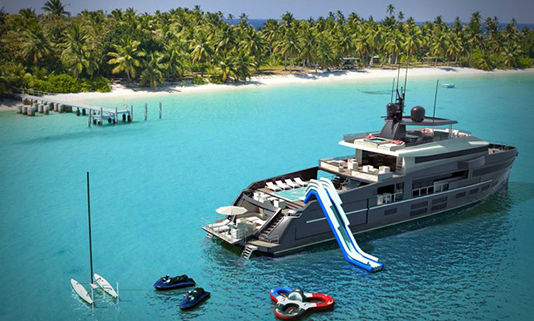 She has been created to offer all the usual superyacht cruising comforts (large cabins, convivial dining areas, great seakeeping abilities, a long range) alongside enough watertoys to bring back the contact with the sea that Manna feels is so sorely missed. 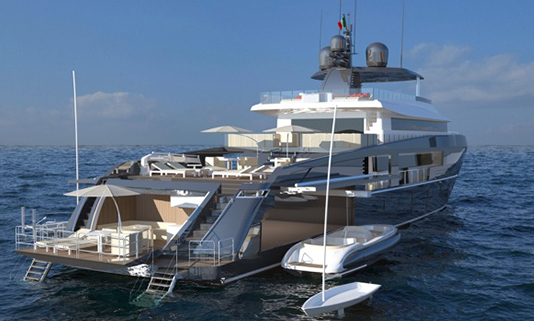 Plans are afoot for an entire Ocea Nemo series ranging from a modest 38 metres up to a substantial 65 metres. Of course the first thing you’re going to need is a cavernous garage and indeed Fulvio has sketched out a full-beam version that can host a guest tender, crew tender, several personal watercraft (jetskis and the like), a boat for wakeboarding, and with space left over for more gear from paddle boards to kayaks. 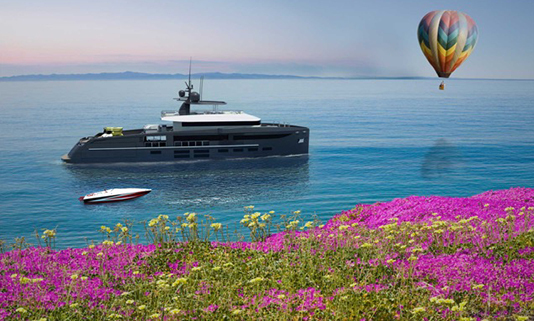 The guest tender can be up to 26 feet in length, which is quite some size for a 44-metre boat. With the garage now likely to be a little full, Fulvio has added a raised level between the main and upper decks to stow some very special toys – perhaps you’ll pop your sailing boat, speed boat, hydrofoil, hovercraft, amphibious car, personal submarine and amphibious aircraft with folding wings here, alongside the ‘over-the-rail’ toys that have become massive hits over recent years such as water slides, blobs and climbing walls. Of course some guests won’t be so keen to mess up their make up or wreak havoc with the dentures, so there’s also a 25 square metre beach club for lounging and an equally-large swimming pool for a leisurely swim which can filled up with fresh or sea water. Inflatable platforms can also be deployed to bring the beach club right to the sea. 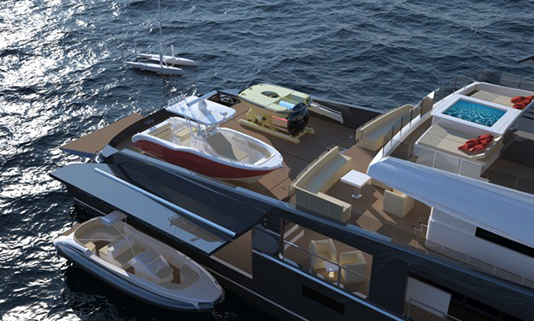 The concept’s cabin arrangement sleeps ten but, as you would expect from this category of yacht, layouts can be customised to fit. Job well done I’d say, Manna.